Everyone inherits mitochondrial DNA (mtDNA) from their mother - through her mother, her mother, her mother, her mother, and so on - represented by the pink boxes on the pedigree chart below. Both males and females inherit mitochondrial DNA from their mothers, but only females can pass it on to their children. If a person has an exact match on their mtDNA with another person who has tested (at the Full Mitochondrial Sequence level), it indicates that they descend from the same female somewhere back in time - but it can't necessarily tell you where and when, as the mtDNA can remain unchanged for many generations, even hundreds or thousands of years. So an exact match could be related very distantly, but could also be a very close maternal line relative... it all depends on who has done the FMS test and is in the matching database. The pedigree chart below shows (in pink) people who could potentially share the same mtDNA as you - providing there are no non-maternal events, such as adoptions, in the direct maternal line. A person could potentially share a mitochondrial DNA match with a descendant of any direct-line female in the pedigree, going back many hundreds of years, not just the generations shown in this chart. Males shown in pale pink also have the same mtDNA, but cannot pass it on. Cousins identified with gold stars can be male or female, as their mothers are direct female descendants and pass their mtDNA on to them. You are not restricted to testing the mtDNA of your own maternal line. You can test your father or any of his siblings to discover the mtDNA of his mother's maternal line. If you can find a willing relative who descends from any other direct maternal line in your tree, you can test their mtDNA to investigate that line genetically too. The person you test can be male or female, as long as their mother directly descended through that particular maternal line of interest. In the chart below, for example, you could test your father, a paternal uncle or a child of a paternal aunt to determine the mtDNA of your paternal grandmother's maternal line. mtDNA tests at the people-matching level for genealogical purposes are only available through Family Tree DNA. It is recommended that if you decide to test your mtDNA, that you do the Full Mitochondrial Sequence (FMS) test. Testing at a lower (usually cheaper) level is not genealogically useful, as the resulting haplogroup will be too broad, and too far back in time and with less confidence. 23andMe and Living DNA provide mtDNA haplogroup 'predictions' with their autosomal DNA test results, but they are not equivalent to the FMS test. They test a number of branch-defining SNPs only, not every SNP in the whole mitochondria. The following table is from Family Tree DNA's Learning Centre page covering mtDNA Basics. It demonstrates the confidence and generational range for the different mtDNA testing levels. Connecting maternal lines where no paper/traditional records are available. Determining if two females with the same surname were related (eg. if living near each other). Determining if females in different locations but with unusual maiden surnames were related. Determining the earliest known origins of a maternal line, by connecting with matches who have researched their line further back. Research hints: if your most distant known maternal ancestor has an unknown maiden name, an exact FMS match in her place of origin might provide clues for that missing maiden name. Research hints: if your autosomal DNA matches share a mtDNA FMS haplogroup with any of the tested mtDNA lines on your pedigree, hone in your research on those particular direct maternal lines. Maternity questions: Do siblings have the same mother? Do cousins share the same maternal grandmother? Which wife of a male ancestor who married more than once was the mother of particular children? In combination with autosomal testing, it can help determine if prevously-unknown cousin matches are related on the maternal or paternal side of the family - or at least help by ruling out particular relationships. Can I Share an mtFull Sequence test with others? Potentially, yes. 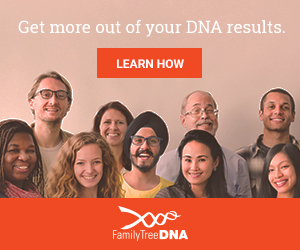 One mtDNA test result can be shared amongst many members of your family. My own mtDNA test haplogroup result should be the same for me, all my sisters, my brother, my mother, her sister, my female cousins, my own daughters, my son, my Nana's sisters' daughters' children, and many more of my known more distant maternal direct-line cousins. Do one test, split the cost. The result becomes very useful when matching with much more distant relatives or branches that we haven't connected to yet, such as lines back in the country of origin. If you are sharing an mtDNA test with others, ensure you already match them as expected on your autosomal DNA so you are not making incorrect assumptions. Mitochondrial DNA generally remains unchanged for hundreds or thousands of years, so is ideal for sharing. But be aware that there have been some cases of close relatives having different results (one or more mutations in recent & current generations; see links below), so if you suspect that is the case, it would be wise to do an mtDNA test on a couple of known cousins to ensure that there are no recent generation mutations. For example, I have tested myself and a 2nd cousin once removed (2C1R) and our mtDNA matches exactly, so it appears there have been no mutations in our two mtDNA lines since our shared ancestor in 1865. My next step is to test some more distant mtDNA cousins to see if we still match even further back. The mitochondrial DNA database is not as big as autosomal DNA databases, so you may not get exact or close matches initially. But because an mtFull Sequence test examines every SNP on the whole mitochondria, you never need to upgrade... you've tested the lot. So you can just wait for new matches to appear as more people test. Link to mtDNA tests at Family Tree DNA. Also read about Y-DNA tests - the Direct Paternal Line, and atDNA tests - to find matches on all ancestral lines.